Above: Urapuntja Aboriginal Corporation administrator Diane Nona with MLA Alison Anderson and local women at Arlparra. The talk on the verandah is sceptical. “If the government is hell bent on change, they need to step up and be here,” says Dennis Kunoth (below left), Indigenous Engagement Officer at Arlparra – also known as Utopia. His wage is paid by the Department of Prime Minister and Cabinet but he is not afraid to speak his mind. 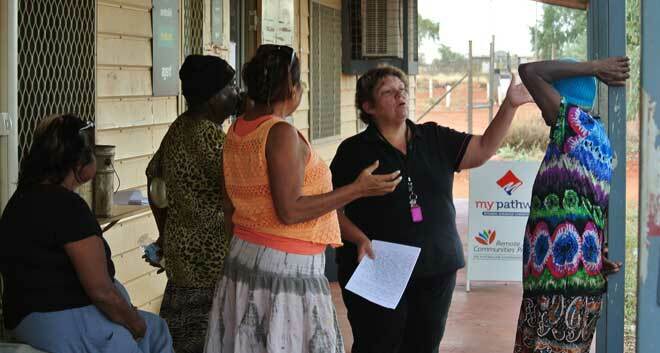 Instead of a visit, Arlparra gets a form letter from the Department of Indigenous Affairs, signed by the Minister, Territory Senator Nigel Scullion, announcing that they will “transform the way services are delivered by establishing a new, less bureaucratic Remote Community Advancement Network”. The gathering is joined by Diane Nona, employed by the same department as Administrator of Urapuntja Aboriginal Corporation. Before the introduction of the shires this body ran local government. Now it’s a structure with an experienced administrator looking for a purpose. Diane is as frank as Dennis. They don’t get too excited by the apparent winds of change from on high. They’ve been there before. But they are impatient for change on the ground. Priorities are shifting at Arlparra. Traditional owners used to – and some probably still do – want people to live on their homelands and for Arlparra to be a resource centre, delivering services, accommodating service providers. They did not want it to develop as a community. But in this impromptu gathering on the verandah the local Member of the Legislative Assembly, Alison Anderson (Namatjira), is told that the push from locals is now for “housing, housing, housing” at Arlparra. This is what they put to the NT Grants Commission last week, the Barkly Regional Council (formerly Shire) the week before and the inter-agency meeting a few weeks before that, she is told. To get housing the locals would have to sign a township lease. To date that has been resisted, so beyond a “fix and make safe” program they’ve had nothing, while nearby Ampilatwatja, which has signed a lease, has got seven new houses. (This is the figure I hear on the ground but recent council minutes, quoting an NT Housing officer, refer to nine completed, with renovations for 12 in the pipeline). Above: New housing at Ampilatwatja. Note also the bitumen road. There are only dirt roads in Arlparra. Rubbish disposal at Ampilatwatja also appears to be more effective. In Arlparra a lack of housing doesn’t mean that people aren’t settling there: it is becoming a de facto community. 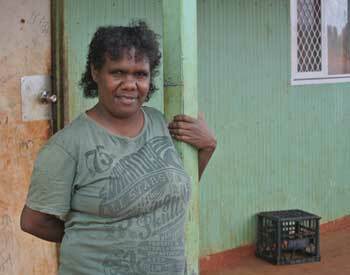 Trudy Raggett, originally from Mount Liebig, shows me her two-bedroom house. 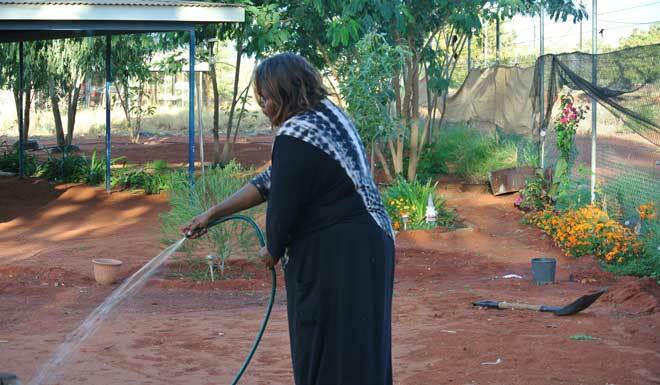 She and her partner, local man Simon Kunoth, and their three children have one bedroom, while his brother Alan, the partner of her sister Sallyanne, share the other bedroom with their three children. There’s a kitchen-come-living room in the middle and a narrow verandah at the front. Trudy(at left) is happy with repairs to the house recently done by a Centre for Appropriate Technology crew, and in particular with the new windows. 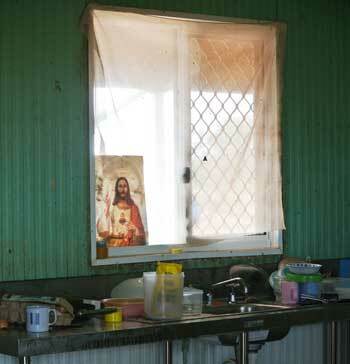 In a former “fix and make safe” – under SIHIP, says Ms Anderson – the window frames were covered by a stiff plastic sheet, pop-riveted into place. CAT installed proper windows that open and close, with fly-screens and security grilles (see left & below right). 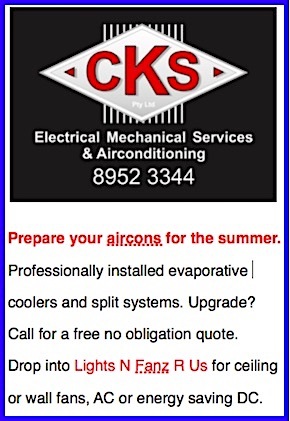 They also built a simple stand for the small air-conditioner, which previously balanced on the top of a wheelie bin, and added a wind-break at the end of the verandah exposed to the south. There’s no doubt that the little house is over-crowded by mainstream Australian standards, and Trudy says they would like a four-bedroom house – a modest wish for four adults and six children. She attended one of the recent community meetings where township leasing was discussed and has since talked about it with Simon. It seems they are uncertain about the politics – from insiders and outsiders – that surround it. Her voice trails off. Is living on one of the 16 Utopia homelands an option for them? Not really. At Apungalindum outstation Simon and Alan’s parents have a three-bedroom mud brick house, also recently upgraded by the CAT crew, but they share it with their other children, three daughters and a son. In any case, Simon has a job with the council on the road maintenance crew (as we drive towards the Plenty Highway later, we see him operating the compactor.) And Sallyanne works at Aged Care in Arlparra. Two good reasons to live centrally, especially in a place where you pay well over $2 a litre for fuel – and that’s if you have a car. At Aged Care I meet Brenda Inkamala, long-time manager of the service that helps old people remain on their homelands: “It’s sad when they have to go to Hetti Perkins and Old Timers,” she says, referring to residential facilities for the aged in Alice Springs. She and her staff of three young women prepare and deliver hampers to 30 or so clients in whatever outstation they live in, do their laundry and help with cleaning and showering if necessary. But not of all of them want to stay on their homelands. 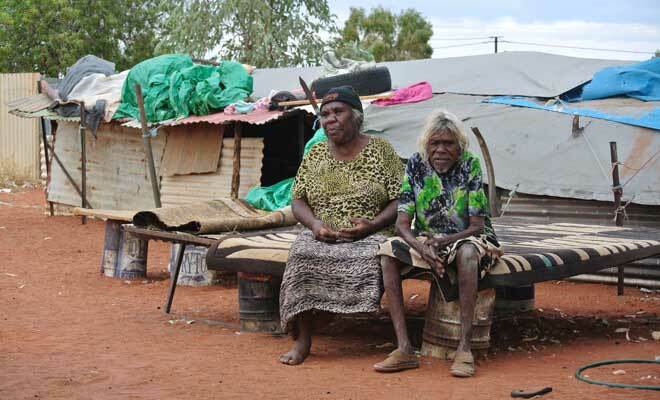 Brenda takes me to see two of her clients, Lena Skinner and Rosie Pula, who live with other somewhat younger single women in a makeshift camp in the middle of Arlparra. They have voted with their feet, sacrificing whatever relative comfort they may have had with their families on the outstations, for the independence of being able to walk the shop and Centrelink when they need to. Above: Brenda Inkamala with her staff, from left, Sallyanne Raggett, Alyssa Club, and Brenda’s daughter, Nanette Sharpe. The women live in the kind of humpies made notorious by decades of reporting. They sit in their sleeping area for a photo (see below). On a fine night they roll out bedding on these platforms. If it rains, the ramshackle tin structure behind is their shelter. The ground around the humpy is raked clean, as it is around the cooking shelter not far away. Food and belongings are kept on roofs, out of reach of the many dogs that live in hope of the odd scrap. Rubbish is pushed up at the edges of the camp. There’s a small generator connected to a freezer, the power cord running along the ground, but neither is working when I’m there. There are no ablution facilities. If the women want a shower, Brenda will take them to Aged Care. They use the bushland at the edge of camp for toileting. Above: Rosie Pula (right) and Lena Skinner outside their humpy. Under the cooking shelter the mood is congenial. The women are delighted with Alison Anderson’s gift of pituri, the native chewing tobacco. One of them is making damper and chops. The first to be served is her teenage nephew. She also hands him a small plastic bucket of tea. Ms Anderson is offered the next damper pancake and eats it, sitting alongside Lena who talks about her childhood moving all around this country with her nomadic family. This must put her in her eighties, says Ms Anderson. A decision about Arlparra and housing may not come fast enough for Lena Skinner. 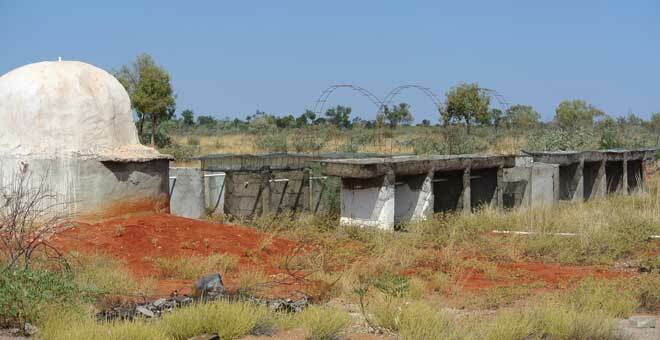 Her situation shows something of the quandary for locals and governments in deciding about future development there. As she moves around Arlparra the message to Ms Anderson is that the mood is swinging towards signing on to a township lease. For the rest of the day, she raises the issue as often as she can with the people who will get to have a say at the next meeting, explaining to them the way it would work. People seem pleased to see her – they get all too few visits from decision-makers. Of course, she is no longer part of the Territory government and thus no longer aligned politically with the federal government. But people seem to appreciate her long record in public life, her ability to relate to their lives and her willingness to speak frankly. “Good on you, keep going!” I hear several times during the visit. 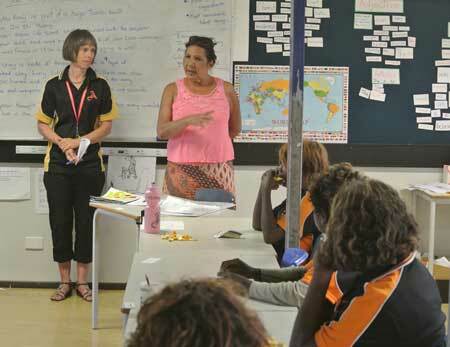 At the school she is invited by the principal to go into classrooms (at left) and talk to the students, for them to see a role model – someone who grew up in a remote community, speaking Aboriginal languages, someone like them. The same thing happens at the youth centre, where she is introduced as “a politician”. “I hate that word!” she says. “I’m your local Member.” It’s a job all about “speaking up for your community”. When the communication is purely in an Aboriginal language, I can only judge her welcome by the smiles, the laughter, the cups of tea, the introductions, the lengthy conversations. There are chuckles about her recent change of political allegiance, joining the Palmer United Party. It started well, he recalls. They got a visit from Terry Mills, then Chief Minister, shortly after the election, but there’s been nothing since. Coincidentally, the day after this conversation the CLP Government issues a media release about advertising a tender for a new police station at Arlparra. The release was made about an hour after the Opposition made one, criticising them for their slowness to move on spending the Commonwealth funding allocated some time back for the purpose. The works will increase “economic activity and job opportunities in the region”, promises the government’s release. The extent to which the letting of one tender will do that is necessarily limited and also will depend on how the tender is managed – whether local employment goals will be adequately built into its requirements, as the Centre for Appropriate Technology has argued for. She is starting to have conversations about developing boarding facilities at Arlparra for children attending the secondary school there (see above), which would seem to fit with the NT Government’s new direction in Indigenous education. At the moment, secondary students are bussed in and out daily from the surrounding homelands, while primary students are bussed to one of four homeland learning centres. Not only might living at Arlparra during the week improve school attendance (up from a dismal 47% at the start of the year, Ms Anderson is told, to 64% in the last month) but it would generate a significant number of ongoing jobs for locals, Diane suggests, such as cooking, cleaning, supervising. 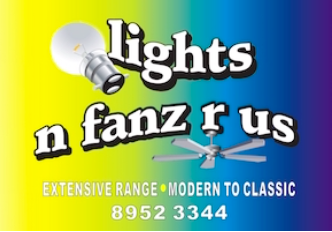 She is also keen to explore the possibilities of developing an art and culture centre, with an eye to attracting trade from passing tourist traffic (the Sandover Highway runs straight past Arlparra). There is already philanthropic interest in helping and the name Utopia has readymade cachet, being associated with one of the most famous of Aboriginal artists, the late E. Kame Kngwarreye. 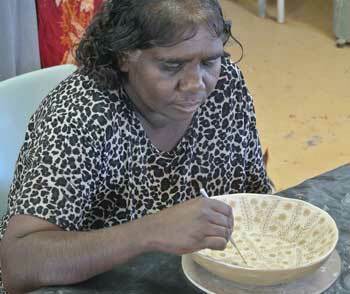 Art is the enduring success story of many Aboriginal communities. After something of a slump at Ampilatwatja, the art centre is well and truly back on its feet. When we are there, a workshop is underway with visiting lecturer Suzi Lyon from Charles Darwin University (above left, with artist Colleen Morton) introducing the artists to ceramics. It is only the second day and already the artists are applying their fine plant-inspired designs to shallow bowls, which they have shaped by rolling clay into a flat sheet, then “flopped” onto a mold and trimmed to size. 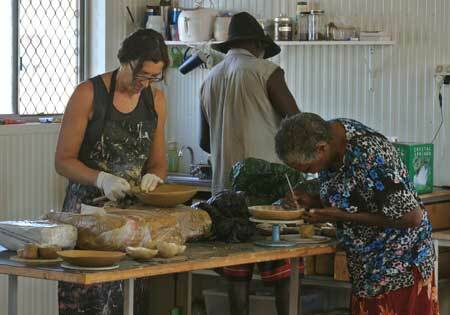 Later they will travel to Alice for a week on campus to complete the process of firing and glazing. At present the art centre is housed in a relatively humble but functional renovated shed. They are hoping for Aboriginal Benefit Account funding for an upgrade to turn over all of it to studio space, while moving the management and storage functions into a new building alongside. Right: Michelle Holmes, one of the best known of Ampilatwatja’s artists. She and her family have been the recent beneficiaries of a new house. Apart from their busy exhibition schedule, Caroline Hunter is always on the lookout for other opportunities. They have recently worked with an interstate designer to develop a limited edition range of silk scarves, which are now selling through major art and cultural institution gift shops. The designs are adapted from original paintings which the artists may have already sold. The licencing agreement will earn each artist some two thousand dollars in royalties for their design. There are certainly some who do. I visit the Family Learning Centre, based at the Arlparra school, where four local women are working as assistant teachers in a program that gets parents and grandparents involved in learning activities with their under five-year-olds – helping to prepare them for starting school. There are also local assistant teachers in the classrooms. 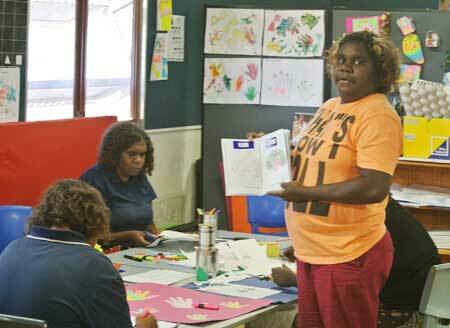 Right: Assistant teacher Miranda Club at the Family Learning Centre, working with her colleagues on learning materials. Opposite Miranda is Dora Mbitjana. 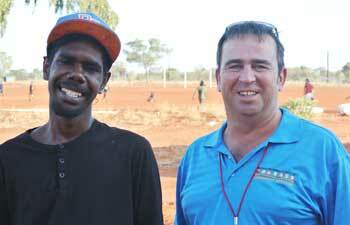 At the youth centre – supported by Barkly Regional Council and CAYLUS – young local man Seymour Long (pictured below with his boss Andrew Rae) turns up to work every afternoon, Monday to Friday, and is studying for his Certificate II in Sports and Recreation at Charles Darwin University. “He has never been on the dole,” Andrew Rae tells me. At the shop, Andrew Ross has worked the till for more than a decade. There are also young local women on the tills at the Ampilatwatja store and a young local man on the petrol pump. There are willing workers for council labouring jobs, the services manager at Arlparra tells Ms Anderson, but their low level of literacy and numeracy and lack of current drivers’ licences rule many of them out for higher paid work, like essential services officer jobs. 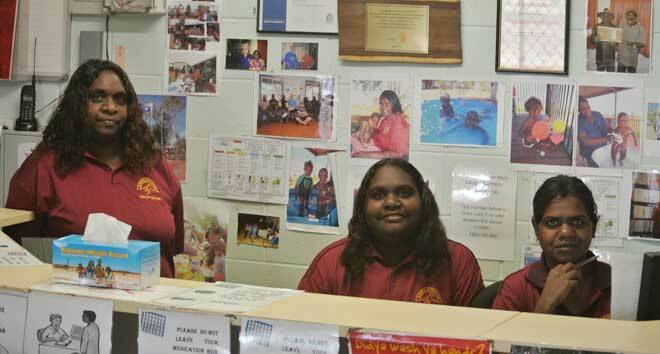 Three young local women are at the front desk of the Ampilatwatja health centre when we walk in. Daylene Woodman has worked there for three and a half years. She’s usually out the back, working in admin with the CEO, she explains, but right now she is training Melita Morton as a receptionist. Yvonne Bonney is a trainee health worker and has been at the centre for two years. Her job includes doing the rounds to pick up patients and bring them in for health checks. 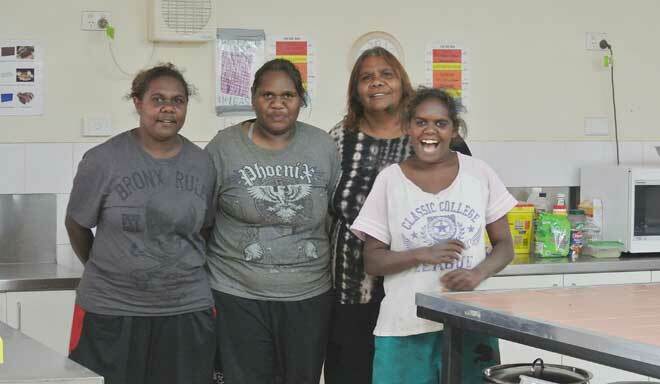 Above, from left: Yvonne Bonney, Daylene Woodman and Melita Morton at Ampilatwatja health centre. What’s lacking too is the get-up-and-go to start small businesses, says Dennis. This is not something from which he suffers. He was taken from his family in the 1960s and grew up in the Retta Dixon home in Darwin. “I was lucky though,” he says, “I always knew who my family were.” He went to school in Darwin and started working life as a jackeroo. After decades in the cattle industry – including as station manger – he came back to his home country about 10 years ago. 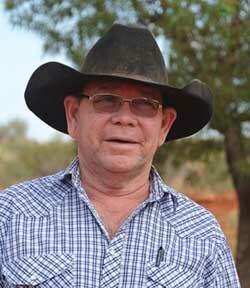 He’s made a couple of attempts to run a small cattle enterprise and it’s still something he’d like to do, if he can get past the hurdles posed by the Central Land Council and Indigenous Business Australia. (He’s philosophical about this – it could be easier, but someone doing business in the whitefeller world would face obstacles as well). In the meantime, alongside his government job, he and his wife have started a little shop, selling basic groceries, out of a shipping container on their outstation, Three Bore. 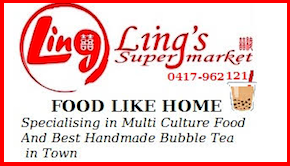 Their main customers are the 50 or so residents of the neighboring outstations on the southern side of Arlparra, but they face strong competition from the community-owned store as well as two station-owned stores in the vicinity. 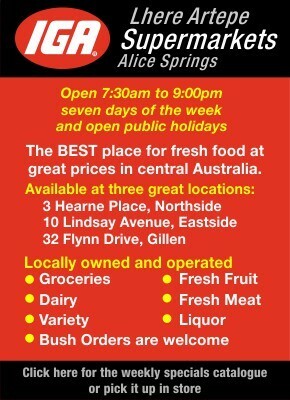 By staying open at convenient times, like on the weekend when the community store is closed, they have done well enough to be now looking at employing a local person part-time. Above: Brenda Inkamala after work, in her garden. “Gardening relaxes me,” she says. The Urapuntja Aboriginal Corporation may be the vehicle for doing that. Dennis used to be the chair and is still a director and he’s pleased that they’ve got an experienced administrator in Diane Nona. “Nothing at all has come out of it so far,” he says. But he remains hopeful. 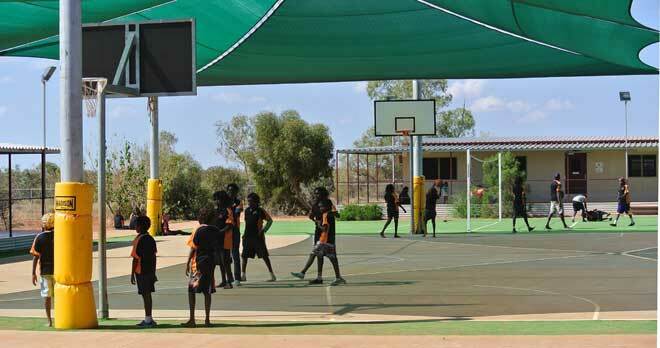 Below: The brand new Commonwealth-funded playground at the Arlparra youth centre. Great article about the positive things going on in Utopia, unlike Pilger’s polemic piece of propaganda. I have visited these places myself and I know the positive things that are going on. There are huge problems still to overcome with no easy solutions. Pilger was especially notable for offering none. Such houses mostly owned by corporate Land Trusts who must accept ALL costs – construction and maintenance, for their houses ! Commonwealth permits these corporate Land Trusts to refuse to issue valid leases to their tenants, thus enables these corporate Land Trusts to avoid responsibility or giving tenants basic rights, maintaining apartheid. When valid residential leases agreements signed, when serious discussion of commercial leases starts, only then can serious improvements for these communities commence. Any word from Commonwealth Ministers Scullion or Brandis on the required legislative changes coming soon ? Think John Pilger could learn a thing or two from you Kieran Finnane. Great piece. Thank you. Great article, Kieran, thank you. I have shared it far and wide across the globe! I would be very interested to find out what sort of positives Mr Dennis Kunoth is achieving out at Alparra and what type of changes he is assisting in. The new houses look wonderful, as they should as they cost over $500,000. Many of the Arlparra residents who have moved in from outstations and now pushing for housing there already have houses provided for them on their outstations. A bus service that zipped around the outstations once a day would solve the high fuel price problem at minimal cost if indeed this movement to the larger centre was based on the cost of fuel. 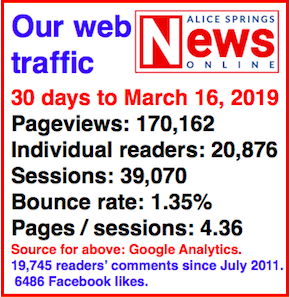 It isn’t of course, the phenomenon of people moving to the larger communities and often moving to Alice Springs is part of a world wide movement towards centralised living with all its attractions. Of course, Australia is the only country in the world where not just a free house but an additional free half a million dollar house is provided to facilitate this movement. At the very least there should be some form of contribution for all remote Indigenous housing. If people are serious they should work for the dole for at least a year at the local council, perhaps cleaning up the community, or helping in the store etc. This is minimal contribution compared with the struggle most non Indigenous Australia go through over 20 or more years to obtain housing. This measure would sort out those who really want housing and I would suggest there would be considerable outrage and little agreement to such as scheme. If that were the case it would be a good thing, those serious about getting a house would get one and value it more and many millions of dollars would be saved by not housing those who would not contribute. 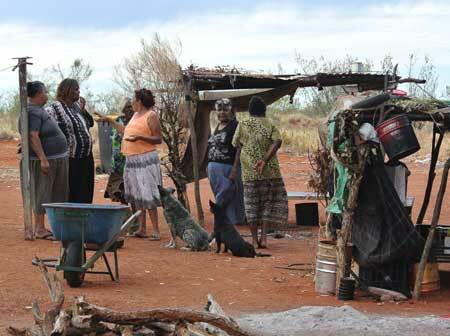 Another considered, well presented article on Central Australia’s remote communities. And timely. If Pilger’s film shows on national TV this weekend, most of us who live here will see through it. Of course there will always be the minority of barrow-pushers who, while they may know better, feel more relevant looking at life with blinkers on. These also have a place in the mosaic of Central Australia. But on the national stage, the damage such bigoted polemicists do is incalculable. False impressions become ingrained in the impressionable minds of those who have never taken the time, or had the opportunity, to spend sufficient time here to actually learn something. And that’s a great pity. Thank you once again Kieran, another excellent piece of reporting. Plenty of food for thought.